We noticed that the shooting media has touted Wilson Combat’s announcement that it will sell the FN “Patrol” .308 rifle for $1995.00. This rifle, as built by FN, has a Hogue black or olive drab stock with an aluminum bedding block. The action is a Model 70 clone. When we saw this rifle on Wilson Combat’s website we thought, “Hmm, that looks familiar….” Sure enough, CDNN Investments is now offering essentially the same FN rifle (but with non-fluted barrels) for nearly $1400.00 less. CDNN is also selling an olive drab (green) version for $699.99. 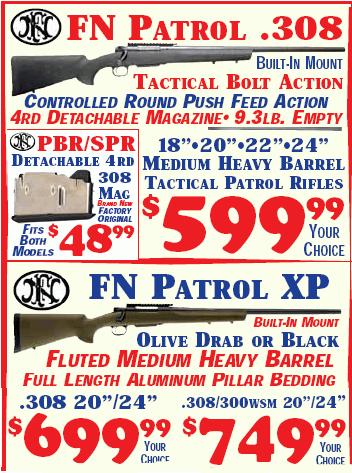 And if you don’t like either Hogue stock, you can buy the barreled action for $499.99, or the FN Patrol short action (complete with scope rail, bottom metal, and detachable magazine) for $349.99. Share the post "How to Save $1400.00 on a .308 Tactical Rifle"
That was my thought exactly when learning of the Wilson offering. Wouldn’t surprise me to find he’s buying them from CDNN. Where do I sign up to be a trigger adjuster?